When I was in San Francisco in 1980, I wandered by accident into a Muni Metro station and was told "This is Muni" by the agent. I'm struck, reading that link, that it sort of appears that the author thinks that it's notable that people in the Bay Area don't use the definite article in reference to numbered highways. When in fact the definite article in that usage always been a particularity of Southern California speech — the Bay Area is just following the most common usage. I've noticed that people from upstate New York also tend to use definite articles in highway names. "The 90" for example. Where I've lived, NJ and Boston, this is not done (that I've noticed). So It's not just a Southern Cal thing. An Australian radio presenter here in London often used to talk about stuff happening in "the Parliament". And you sometimes read foreigners dropping the definite article from "the BBC" – analogous, I suppose, to NBC, etc. I was thinking the same thing, Damon; though Nick's counter-example is noted. In the few large and almost-large cities in which I've lived, I don't recall anyone using articles with freeway/interstate/highway names. But I've only lived in two that were large enough to have more than six such large, "named" routes, and they were both in Texas. It seems to me that use of the article probably correlates to there being many such named routes. How strong a correlation, though, is another matter. Surely, LA has more of these named routes than almost anywhere else? I lived in Rochester and Ithaca for a total of twenty years (for a short time even commuting between the two on the interstate) and I only ever remember it being anarthrously 'I-90'. Has it changed in the ten years since I left? Born and raised Angeleno here. I'm not sure we have an unusual preponderance of named freeways (or freeways in general: Kansas City is actually the metro with the most freeway lane-miles per capita). It seems to me, though, that most people seem to use just the numbers — the 10, the 405, the 5, etc. — instead of the names, which appear only to be used by traffic reporters in helicopters. Toronto also notably uses arthrous highways (the 401, etc). Could this be some cross-lake effect? @Nick: is your upstate New York the Buffalo area? my memory from visting my mom in the Phoenix area was of the radio talking about "the 101"
Definite articles seem to be used most often when there are many different types of freeways, not just interstates. I don't expect anybody anywhere says "I take 90 to work". They'll say "I take I-90 to work" or "I take the 90 to work". This mess of freeway types is probably an artifact of LA building starting it's freeway system in the 30's, long before federal funding for interstate highways was provided. Keeping track of which is which is complicated and unnecessary. It doesn't really provide any useful information unless you're concerned which gov't municipality is paying for that particular stretch of road. Replacing all the proper modifiers with 'the' simplifies everything tremendously. LA will also name a freeway that encompasses several different routes. The Ventura Freeway is at various points the 134 and 101, for example. Phoenix has a mix now, but seems to be going the way of LA. In the past, Phoenix had only 3 freeways: I-10, I-17, and US-60 (or Hwy 60), and that's how they were referred to. This seems to be changing with their expansion over the last 20 years. I-10 and I-17 seem to still take the 'I-' prefix most of the time, but I hear "the 60", "the 202", "the 101" about as often as "hwy 60", "loop 202", and "loop 101". Speaking of common usage, your headline should read "BofA" rather than "BoA," which no one calls it ("Boa" being a large snake or, apparently, a Korean pop singer…). Both "BofA" and "the BofA" are used, though the former is more common. In fact, at one time the bank had a general customer-service number that they advertised as 1-800-THE-BOFA. Now, can someone explain to me what the deal is with my grandfather's college—Ohio State University— now insisting that it be called THE Ohio State University. When the heck did that start, and why? Someone decided to waste money on image consultants? You are dead wrong. I have heard that commonly in Indianapolis, Tampa, and St. Louis. Yep, here in Michigan we drive on 96, or 69, or 127 or the like. Britain is arthrous when it comes to numbered highways, but not with their names (unless the article is part of the road's proper name or common nickname): THE A5 is Watling Street, THE M25 goes round London. One way to tell you are listening to an American is if he talks about taking M25. Another way is to listen to the accent. Because it is a partial loop, sometimes we ride on I-264 EAST when we are going west, and on 264-WEST where it is headed east! No one uses "the" for route numbers around here (Norfolk Virginia) but they do use it for road acromyns such as "the M & M" [the Monitor-Merrimac bridge tunnel ] or "the CBBT" [Chesapeake Bay Bridge Tunnel.] When my GPS uses route numbers for state roads, I have to translate to street names. The Interstate highway is sometimes called I-64 and sometimes just 64, **never "the 64!" Alternatively, in Michigan we drive on the Jeffries (part of I-96), or the Southfield (M-39), but also on Northwestern (M-10), never the Northwestern (but M-10 is also called the Lodge). "On Bart, on Muni, on …" has a sort of "Night before Christmas" rhythm to it. 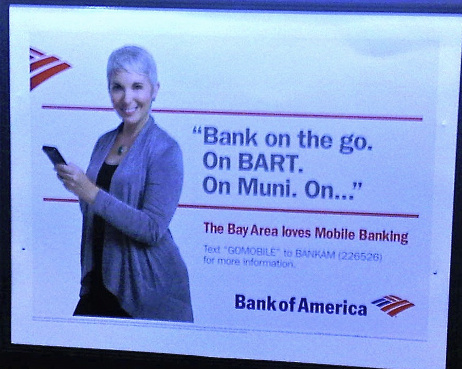 Also, could the writer have been influenced by the tired (in bank ads, I mean) pun on "bank on?" 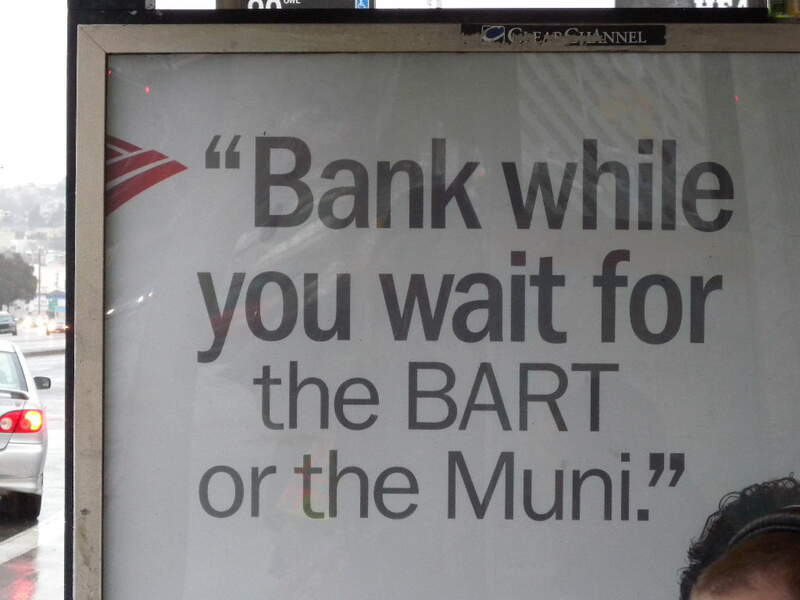 "Bank on x" feels more idiomatic than "Bank on the X." In the Boston area, it's "93", "128" and "Storrow Drive" (and it's "Storrow Drive" even where it's not actually Storrow Drive), but "the McGrath", "the Artery", and "the Mass. Pike". In the Boston area, it's "93″, "128″ and "Storrow Drive" (and it's "Storrow Drive" even where it's not actually Storrow Drive), but "the McGrath", "the Artery", and "the Mass. Pike". My fiancee's aunt and uncle are lifelong residents of LA and the surrounding area. The use freeway names unless forced not to. So for example, they'll tell people to take the San Diego Freeway to the Hollywood Freeway. Or they'll talk about the Santa Monica Freeway. I was talking about it with them one time and they said that it was more precise because the names correspond with a specific section of the freeway going a specific direction. I.e., I-5 is only the San Diego Freeway when it's going south and then only from a specific point on down. Kim and I speculate that's why they use the definitive article when talking about freeways. Bart – not "the Bart"
Muni – not "the Muni"
101 – not "the 101"
280 – not "the 280"
880 – not "the 880"
17 – not "the 17"
I'm not Nick, but yeah, it's definitely a western WNY thing to preface everything with 'the'. I have friends as far east as Batavia who do that, but personally I've never heard it in Rochester, and I certainly haven't heard it in CNY (which is where I'm originally from). I wonder if you aren't correct about it carrying down from the GTA– from all my parents talk about (they grew up in the Niagara Falls area), western WNY used to hugely skew that direction culture-wise, which I don't think is so much the case for Rochester or Syracuse. I saw a 2005 Sci-Fi channel remake of War of the Worlds with C Thomas Howell. Supposedly they lived in Virginia – in Greensboro. Our hero was trying to make it to DC to meet up with his wife, but the bridge was out and he couldn't get to Hopewell. As he stood there, all baffled, a woman walked up to him and informed him that the bridge was out, that "the terrorists got DC and the big cities first off", and that she herself was "gonna walk west, to the 40, and down to Tennessee." And despite her quaint folksy drawl, not for one minute did I believe she lived anywhere in Virginia. There are also outlanders who call it "the Silicon Valley." The main artery in our town is Texas Highway 6. Nobody says that. In addresses, it's Earl Rudder Freeway. Nobody says that, either (except maybe in advertising). You can go north or south on 6; take Hwy 6, or take the bypass. On the other side of town, we have Farm-to-Market Road 2818. Nobody says that, either. Its other name is Harvey Mitchell Parkway. Some folks are learning to use that. For most of us, it's just 2818. You can add the Cleveland area to the list of places where people "take 90 to work", though "the Shoreway" may be more likely for that interstate. Certainly you take 271 and 480 anacrously and anarthrously. It's true that people elsewhere tend to add a "the" to Silicon Valley, even when no local person would do that. Another thought: No one in D.C. would ever say, "I'll just take Metro." But then, "metro" is more like a synonym for "subway" and "I'll take subway" sounds a little Russian immigrant-ish. I can't speak for the "precise" usage, but my only experience with name usage for a freeway is almost always with older residents. [or traffic reporters as @Andrew points out] My impression is that most under ~25 tend to stick to "the X" for everything, save PCH. I'd wadger most of us couldnt even name all of the 'names' for them haha. On the phoenix matter, I'm of the experience that they seem to side with southern californian use. I'm sure the sizeable amout of californian transplants in the last few decades had a hand in that. I'm always surprised "the x" and "freeway" usage occurs in other places. Growing up here, you could tell someone was a transplant because of the use of "I-X" and "highway/turnpike/parkway" when explaining driving routes. This effort to get chummy with Bay Area locals must be one of many such campaigns. Here in the Boston area we now have BofA billboards proclaiming with leaden humor that there are "more ATMs than dropped Rs". I've lived in the DC area for over half my life, including being born here. "I'll just take Metro" doesn't jar my ear the way "I'll take the 395" would. Highways here are either the number or number with prefix "route 50". The most locally peculiar usage to my ear, having been raised a hundred miles south, is the use of the 'inner loop' and 'outer loop' to describe direction on the Beltway (always "the"). But then I have not lived in another city with a similar highway. The thing which I thought distinguished Northern Californian usage is that we do actually say "I'm on 80, I'm outside Berkeley", and only very occasionally "I'm on I-80". (Thinking about it now, I'd add that we might say "I'm on 80 East," but that might be a self-reporting error.) So while it's ordinary-ish to be anarthrous, it's not ordinary to leave off a preface entirely. Is that wrong? A lot of the freeways in the San Francisco area have names, but they are very rarely used. @m.m Well, they are older residents. And they vigorously defend their use of freeway names. Maybe because younger residents don't. Up in San Jose, I do know of one freeway where the residents use the name, Guadalupe Parkway (aka 87). I don't know why, it's a fairly new highway. At one time the LA area freeway names (e.g., Santa Monica Freeway) were in general use – in particular, the freeway signs used them. At some point the names were dropped from the signs, and then gradually fell out of common use, at least with younger people, leaving only the 'the' in front of the number. I grew up in San Diego, where freeway names were not on the signs and were rarely used, and I never said 'the' 5 or 'the' 94, etc. Stephen Nicholson: Silicon Valley has a network of "expressways" which have only names: Capitol Expressway, Almaden Expressway, etc. These are high-capacity streets with intersections, but the intersections are only with major streets. The Guadalupe Parkway was one such. Later it was upgraded to a freeway and extended, becoming Highway 87, but the old name is still in use. I've heard a few people talk about "the Nimitz", but I've never heard anyone talk about the Sinclair Freeway, Sanchez Freeway and the others. PS People usually say "Capitol Expressway" and the rest anarthrously. I'd agree that all numbered (or alphanumerical) British roads are arthrous, but not that their names are inevitably anarthrous. I find it natural to use a definite article with a Road, but not with a Street or other road name. Thus in London I'd naturally say the King's Road (aka A3217) or the Bayswater Road (A40), but just Park Lane (A4202), Victoria Embankment (A3211), Kensington High Street, Kensington Gore or Knightsbridge (all A315). Bobbie reminded me of Nortwest Highway in Dallas, which has a section that's commonly called West Northwest Highway. So I imagined a building at the southeast corner of West Northwest Highway and some cross-street, just to get all four cardinal directions in one thought. And I won't mention Peachtree Corners Circle in Atlanta. Tyro's point is a good one. When the first sign went up, could you get cell phone reception underground? Evidently you can now, because you can do your online banking while riding the trains and not just while waiting for them to arrive. "Choice of prepositions (or choice of postpositions, and similarly choice of noun cases where applicable) is one of the many aspects of morpho-syntax and morpho-phonology which are regularly quasi-regular." So is arthrousness (arthrosity? ), apparently. Erm, the signage is still there though. The 60 still has "pomona fwy" plenty of times until it becomes the "moreno valley fwy" eastbound. The 210 still has "long beach fwy" signs. Same for the 101 and the 5 and the rest, especially at interchanges. What did you call them then, highways? haha. Josh is very confused about California freeway numbering. The various things he calls "county" highways are actually State Highways – county highways have a letter (J4, etc). Unlike some states, California does not allow number collisions between different types of highways (Interstate, U.S., and State), except where the same numbered highway changes type (I-238, CA 238). Thus there is no need to qualify "101" as "U.S. 101", or "57" as "California 57" in most uses. Interestingly, when Bay Area people use the name of a freeway instead of the number, they usually *do* attach a definite article: "The Nimitz Freeway", "The Eastshore Freeway", "The Guadalupe Freeway". BofA should have known better, as it's originally a San Francisco bank. But as BuboBlog points out, it's headquartered in North Carolina, after having been taken over by NationsBank. Many people I know here in SF refer to "the 101" (using the definite article) and "280" (dropping the article). It's also how I refer to the local highways. I moved in the last year from Texas, but I have no history of referring to highways using definite articles. In Autin, Interstate 35 was always "I-35," "IH-35," or just "35." We also referred to "Loop 1," "Mopac," and "183." Prior to SF, I never lived anywhere but Texas, so you may want to rethink the SoCal shibboleth you're using. To add a few more data points, in mid-cities North Texas, there is "1709"/"FM-1709" in Southlake, "114"/"Highway 114" in Grapevine, "Loop 360" in Arlington, "121" in Lewisville, and "35W." However, lots of people drive through "the mixmaster" every day. I definitely didn't pick up prefixing highways with definite articles until referring to "the 101" after moving to San Francisco.